St. Paul High School, Tenth and Minnesota, St. Paul, 1886. - Minnesota Historical Society photo. When the Minnesota Territory was formed, the three existing "cities" were St. Paul, St. Anthony (present day Minneapolis), and Stillwater. The cities competed for the home of the three most important institutions. St. Paul became the capitol, St. Anthony gained the university (University of Minnesota), and Stillwater gained the prison. in 1856, a small group of citizens decided that a school district must be established. The mindset was that if excellence is the goal, then “good schools would attract good settlers.” In 2007, our district proudly served more than 41,000 students. Watch "Saint Paul Public Schools: 150 Years of Excellence"
In 1847, Harriet Bishop traveled from Vermont to the small but growing city in the West, St. Paul. As part of a program led by educational reformer Catharine Beecher to send women teachers to help educate and civilize frontier children, Bishop was the first of her class to volunteer to go West. She came to the area that would soon become the Minnesota Territory to both educate the children of St. Paul and to exert her moral influence on the rough frontier town. Convinced that women were capable of teaching morality, Bishop became active in many moral issues such as temperance, educational reform, and women's suffrage. She is credited with starting the first public school in St. Paul and the first Sunday school, which led to the first Baptist church in the area. 1856: Saint Paul’s first school board consisted nine elective and two ex-officio members. 1870: Two students, Fannie Hayes and A. P. Warren, became the first two students to graduate from Saint Paul high school. 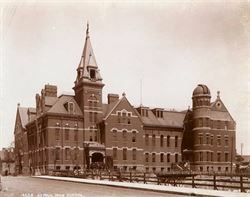 1879: Saint Paul High School has eight teachers and a principal, which this high school became known as Central High School. 1897: Grover Cleveland High School opened, which later renamed Johnson Senior High School in 1911. 1914: Saint Paul city government seized power of all school matters, equivalent to the school board. 1950: Saint Paul Public Schools Board of Education re-established again after years of intense campaigning by civic-minded citizens. 1954: The United States Supreme Court ruled that public education between minority groups and the majority could not be “equal” if it remained “separate. 1960: Hazel Park JHS offers more than 40 subjects in its Adult Education program. 1964: Saint Paul Public Schools addressed the concerns of racial imbalance in the school district by developing resolutions that students have equal educational access. 1970-73: Arts Education at SPPS was being evaluated, which a consideration to add more arts program to the schools. 1991: Saint Paul’s high school graduation rate is 73%, among the highest in the country. 2004: Feb. 28: More than 6,000 supporters including students, parents and school staff rallied at the Capitol for the state to support education funding.